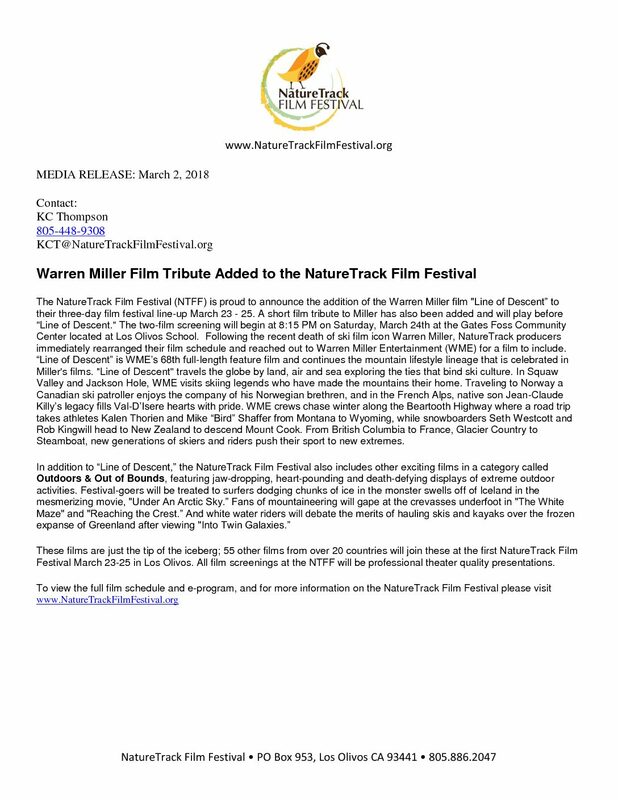 The NatureTrack Film Festival (NTFF) welcomed enthusiastic audiences to Los Olivos for its debut weekend March 23-25. 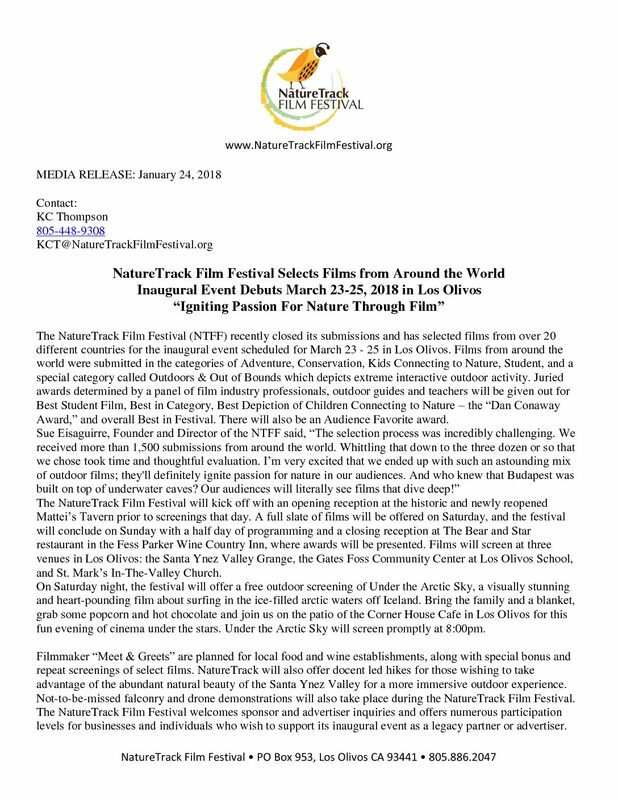 Films screened at three venues: The Grange, St. Mark's In-The-Valley Church, and the Gates Foss Community Center at Los Olivos School, and the town was bustling with attendees and scores of volunteers sporting bright blue NTFF signature tee-shirts and sweatshirts. After a Friday kick-off reception at Mattei's Tavern, 59 films played over three days before the winners were announced at the Sunday, March 25th closing reception hosted by the Fess Parker Wine Country Inn. Filmmakers Keith Malloy and Stephen Matter were present to accept their awards. 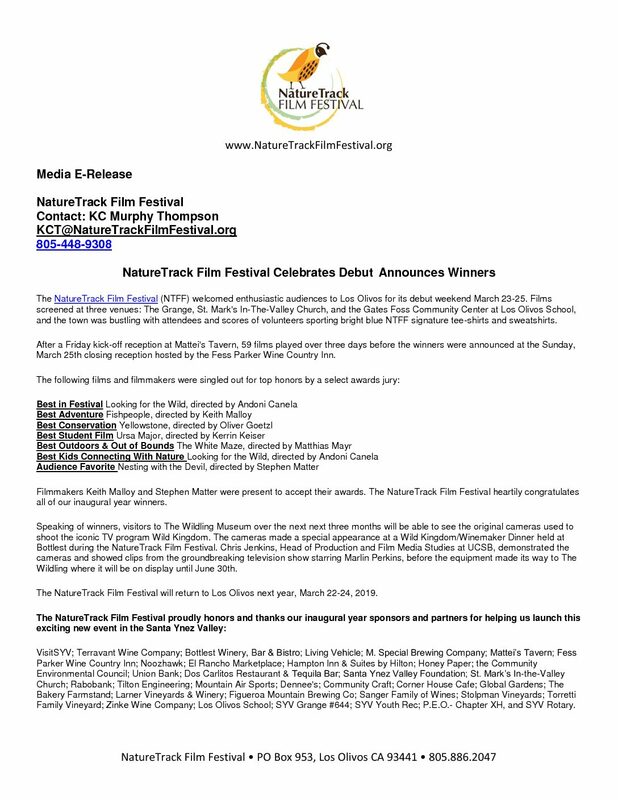 The NatureTrack Film Festival heartily congratulates all of our inaugural year winners. Speaking of winners, visitors to The Wildling Museum over the next next three months will be able to see the original cameras used to shoot the iconic TV program Wild Kingdom. The cameras made a special appearance at a Wild Kingdom/Winemaker Dinner held at Bottlest during the NatureTrack Film Festival. Chris Jenkins, Head of Production and Film Media Studies at UCSB, demonstrated the cameras and showed clips from the groundbreaking television show starring Marlin Perkins, before the equipment made its way to The Wildling where it will be on display until June 30th. 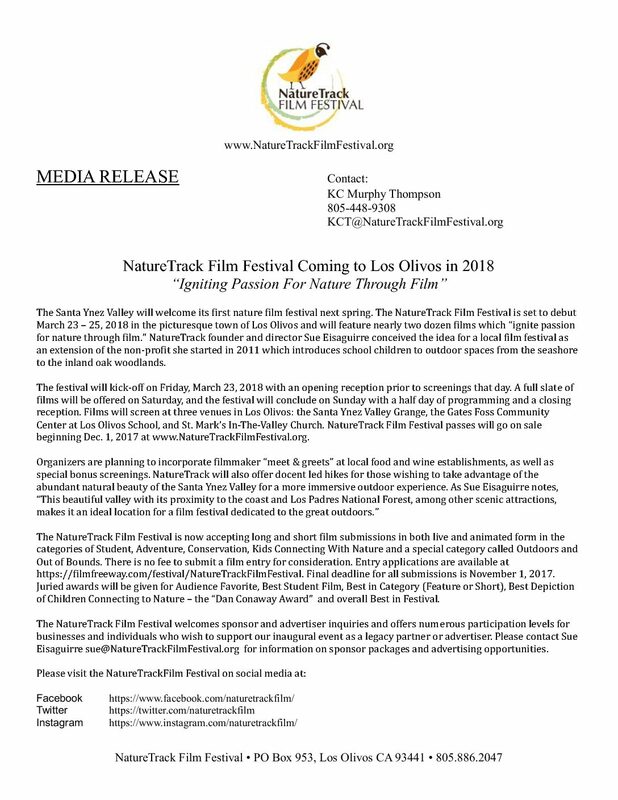 The NatureTrack Film Festival will return to Los Olivos next year, March 22-24, 2019. VisitSYV; Terravant Wine Company; Bottlest Winery, Bar & Bistro; Living Vehicle; M. Special Brewing Company; Mattei’s Tavern; Fess Parker Wine Country Inn; Noozhawk; El Rancho Marketplace; Hampton Inn & Suites by Hilton; Honey Paper; the Community Environmental Council; Union Bank; Dos Carlitos Restaurant & Tequila Bar; Santa Ynez Valley Foundation; St. Mark’s In-the-Valley Church; Rabobank; Tilton Engineering; Mountain Air Sports; Dennee's; Community Craft; Corner House Cafe; Global Gardens; The Bakery Farmstand; Larner Vineyards & Winery; Figueroa Mountain Brewing Co; Sanger Family of Wines; Stolpman Vineyards; Torretti Family Vineyard; Zinke Wine Company; Los Olivos School; SYV Grange #644; SYV Youth Rec; P.E.O.- Chapter XH, and SYV Rotary.